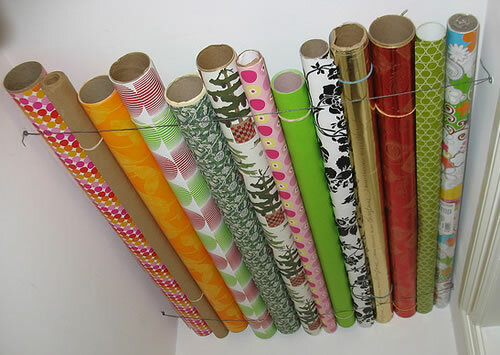 Do you store your wrapping paper in your scrapbook room? I would like to move my wrapping supplies to my craft area, because I usually find I’m running to three different rooms when I need to wrap a present. I grab the box of wrapping paper that I have stored under my bed, run upstairs to the craft area to get ribbon and other package embellishments, and then back down to the kitchen for Scotch tape. The only reason I haven’t moved my wrapping supplies to my scrapbook room is because of storage. 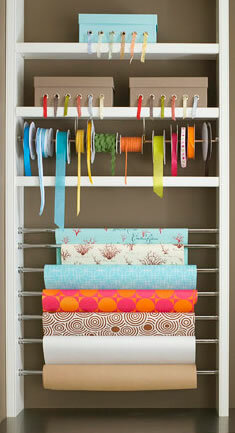 I absolutely love this wrapping paper wall rack from Alissa at 33 Shades of Green. Check out her tutorial to learn how she used a 36″ x 24″ open back frame and 28″-48″ cafe rods from Hobby Lobby to make her wrapping paper wall rack. Cheap, easy, and practical – this idea from Frank Farm’s photostream at Flickr gets two thumbs up! He uses galvanized wire and screws with anchors to store wrapping paper in the unused ceiling space of a closet. 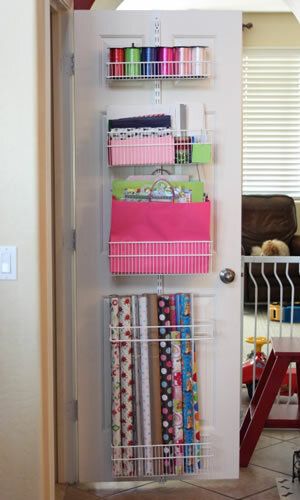 The trick to good organization is to make use of every possible space, as Kate at Scentsational Girl did for her handmade behind the (laundry room) door wrapping paper rack made using plywood, dowels, and cup hooks. She appears to be fairly handy with power tools. Unfortunately, I have two left thumbs when it comes to that part, so I would probably need to enlist the help of my husband to make this, but it definitely seems do-able! 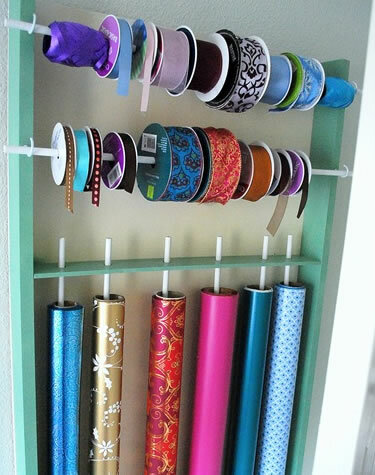 I was trying to steer clear of The Container Store and similar solutions (mainly because of cost), but when I saw how Kelly at steveandkellyhurt.blogspot.com organized her wrapping supplies using an over the door Elfa rack, I couldn’t help but add it to my list of ideas! Kelly also did something that I need to do – she went through and purged her supplies. I have such a hard time throwing ANYTHING away – you should see just my box of gift bags (actually, you shouldn’t!). Leave it to Better Homes & Garden to share this idea – turn a bookcase into a wrapping paper station! They used tension rods to hold the rolls of paper, and baskets with bows and bags can be stored on the bookcase shelves. Maybe I’m making this far more complicated than necessary. Look how pretty this gift wrap looks displayed in a simple wire basket. Of course, it doesn’t hurt that Ez at Creature Comforts has great taste in wrapping paper! If I did something like this, I might be tempted to throw out my old rolls and buy a new assortment that looks like hers (which wouldn’t be very thrifty of me!). 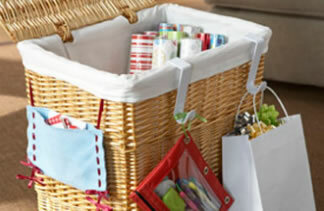 This wicker hamper basket from Home Made Simple is similar to the wire basket idea, but might be an even better solution. I like how they used inexpensive over-the-door hooks to hang bows and other supplies from the sides of the hamper. 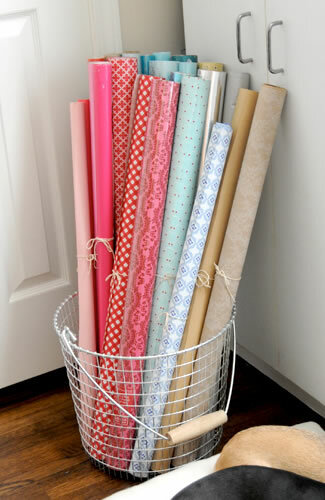 If you have any other gift wrap storage ideas, I would love to hear them! 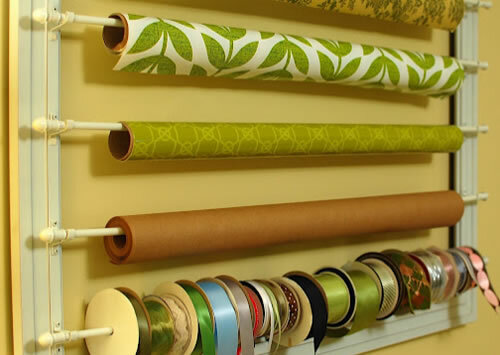 Leave a comment below letting us know how you keep your craft room and gift wrap organized! Love the DIY wall wrack!